Over the past years, smart phones built on Android OS have been gaining more and more popularity worldwide. Most Mac users are now not content with playing DVDs on the DVD player but want to watch the DVD movie on Andriod phone, however, the fact is that Android phones only read and play video in relatively few formats H.263, H.264 AVC, MPEG-4. That is to say, if you want to watch DVD movies for more fun on your Android phones, such as Galaxy S7/S6/Edge, Surface Pro 4, HTC One M 10/9, etc, you need to rip DVD to Android Phone compatible video formats firstly and then import the converted videos to your phone. Luckily to all Mac users, DVD Ripper is the only thing required to convert DVD discs for future playback on Sasmsung, Huawei and other Android phones. MacX DVD Ripper Pro is among the most outstanding programs for users to convert and rip DVD movies to Android based smart phones. The beauty of this tool les in its terrific ease of use and robust support for ripping copy-protected DVDs. Thus, even users who have never ever used DVD ripper before should find it a piece of cake to rip copy protected DVD on Mac. And they are equipped to convert or rip whatever purchased DVDs that they need to play on Android phones with the assistance of this DVD converter. 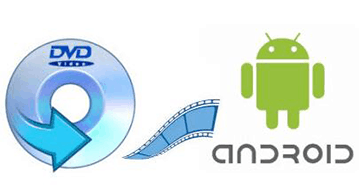 How to Rip DVD to Android on Mac Using MacX DVD Ripper Pro? Before you rip new movie DVD releases to your Android phone, you only need to take a while to download MacX DVD Ripper Pro to you Mac. Install and run this Mac Android DVD ripper, click "DVD Disc" to add DVD from DVD drive. Or you can click "DVD Folder"; or "DVD ISO" to import DVD from DVD folder saved on your hard drive. Just choose the Android phone that you are using under "to HTC", "to Sumsang" or "to Huawei" and select the video format that you need to rip the DVD to in the profile setting area, for example, rip DVD to HTC One M8, rip DVD to Huawei Mate 10 (Pro), etc. After you finish all the steps above, click "start" to begin ripping new DVD movies to Android on Mac. You can view the conversion progress and are able to cancel the converting process at anytime. For Windows users, MacX DVD Ripper Pro for Windows (Win 10 included) would help to rip the DVD videos that you need to your Android phone in 4 simple steps at a fast speed. If you have some videos that your Android phone could not read and play, for example, AVI, HD MKV, FLV, HD M2TS, WMV, Xvid, DivX, FLV, MPEG, MOV, you may try a free video converter called MacX Free Mobile Video Converter; if you also want to play DVD on iPhone iPad iPod, you can try this sought-after iOS data manager - MacX MediaTrans to easily transfer the ripped DVD video from computer to iDevices. This tutorial easily guides you rip DVD to iPhone supported MP4 video format with professional DVD ripper. Regardless of all protected DVD you own, you are permitted to watch any DVD movie on iPhone conveniently. Want to know how to easily convert and rip DVD to Amazon Fire Phone with original quality? 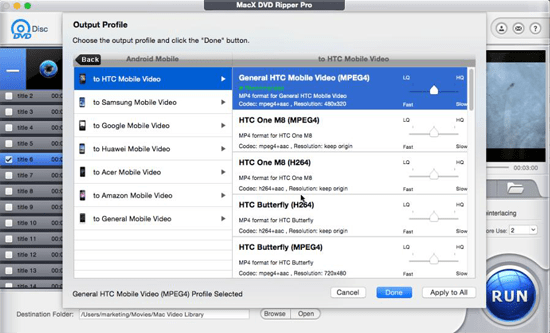 Here MacX DVD Ripper Pro offers the best way to rip DVD to Amazon Fire Phone and convert it into FLV, MPEG, M4V, AVI, WMV, MKV etc to playback on iPad, iPhone, iPod, Android to enjoy on the go. MacX DVD Ripper Pro is the best DVD ripper for Mac which can freely rip DVD to MP4, MOV, M4V Android supported formats or iPad Pro/Air 2/mini 4 and backup any DVD disc, ISO image, DVD folder on Mac (MacBook Air/Pro, iMac etc) in 1:1 quality with original quality.